A Belgian muslim extremist close to a network of Syria fighters threatens with a terrorist attack during the New Year celebrations in the cities of Antwerp and Brussels. In a private Facebook message sent on Sunday to the Belgian newspaper ‘Het Laatste Nieuws’, the extremist pointed out that the firework spectacle along the river Scheldt, the city’s Central Station and the main shopping street Meir are possible targets, while in Brussels the Atomium monument was named. “I’m warning muslims against attending these events and against joining non-believers there”, he wrote. The author of the message is using a Facebook account with the name ‘Madjlis Shura Muhajirien’, a reference to the brigade of foreign fighters in Syria that counted several Belgians in it’s ranks before it was integrated in the ‘Islamic State in Iraq and Sham’ (ISIS). 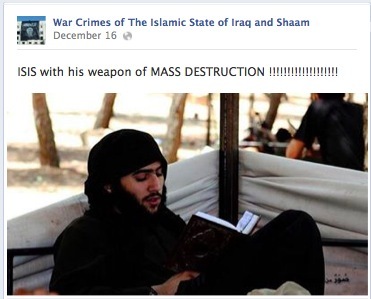 The Facebook account was started early in 2013 within the entourage of Houssien Elouassaki, the former leader of the Shariah4Belgium movement in the town of Vilvoorde, who reportedly has been killed in Syria since. Recently, that same account was used already two times to send threatening messages towards Belgium. One in October — a video in which a masked Syria fighter fulminated with an Antwerp accent against “the descendants of apes and pigs who fight islam” — and another earlier this month — a nasheed-like audio message in Dutch in which the Belgian Defense Secretary Pieter De Crem was warned for a car bomb and the Atomium in Brussels also was mentioned as a target for a terrorist attack. 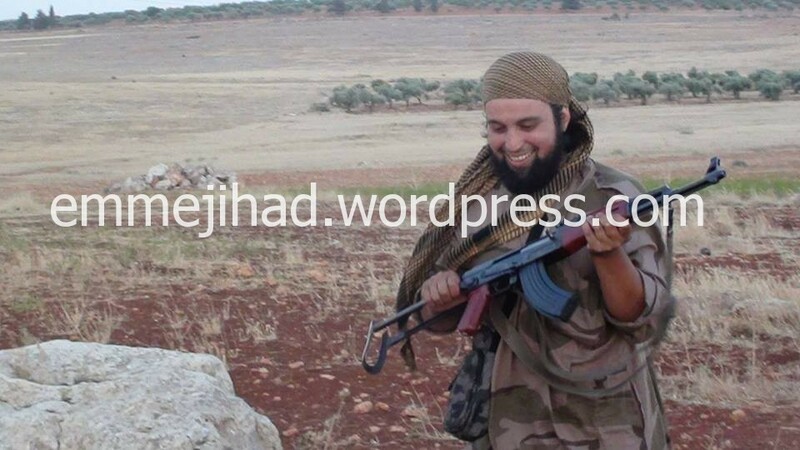 On the internet, photos appeared of a former Shariah4Belgium leader now fighting in Syria. Pictured is Hicham Chaib, who was living in Antwerp and is known as ‘Abu Haniefa’. He used to be the bodyguard of Shariah4Belgium founder Fouad Belkacem and belonged to the trio that took the lead after Belkacem was arrested. Last year, Chaib spent two months behind bars for his hate speech and disorderly conduct during riots in the Antwerp neighborhood of Borgerhout. It was already known he traveled to Syria after his release. But the pictures showing him with a kalashnikov assault rifle are the first of a prominent Shariah4Belgium member coming out of Syria. 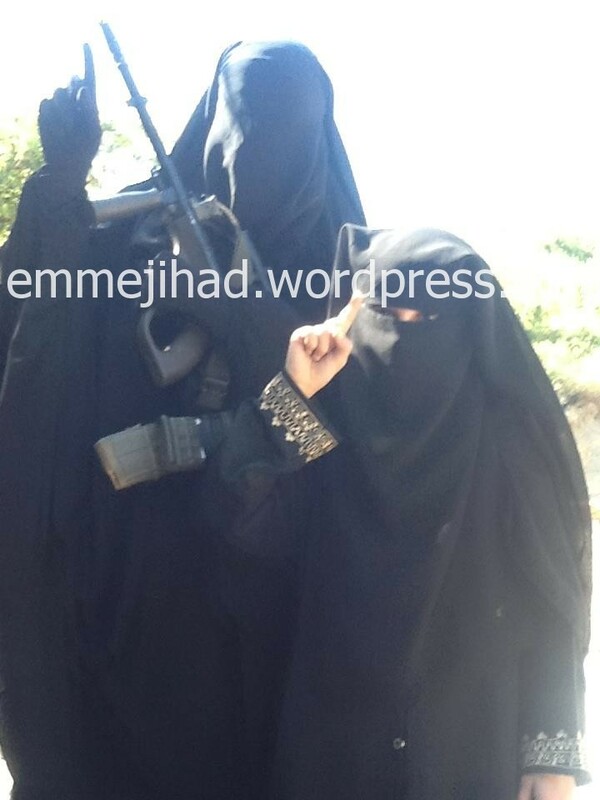 The two other secondants of Belkacem also went to Syria. Abouallal Noureddine (aka ‘Abou Mujahid’) was killed there in July, while Feisal Yamoun (aka ‘Abu Faris’) hasn’t been heard of recently. 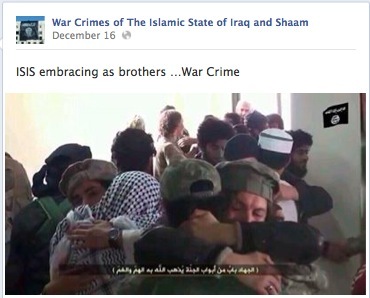 At first sight, the Facebook group that was established three days ago, seems critical for ‘al-Dawla al-Islamiya fi al-Iraq wa al-Sham’ — as ISIS is named in Arabic. 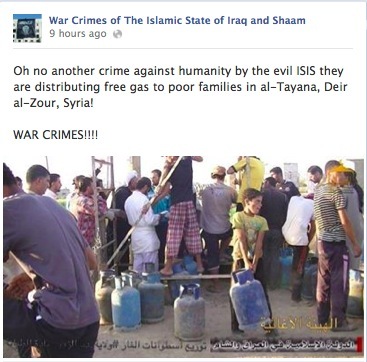 But the reference to war crimes committed by ISIS in the name of the group is clearly meant to ridicule such accusations. A look at the more than 700 people who had liked the page today already, also learns a lot about it’s real purpose. Most of them are muslim extremists openly supporting ISIS in it’s struggle for an islamic state and in cruelties such as random killings and beheadings — as their profiles and other likes show. They come from all kind of countries, with a significant share from Belgium and the Netherlands. Among them is at least one of the actual Belgian Syria fighters — ‘Abu Dujana Al-Muhajir’ from Brussels — and remarkably enough also Jejoen Bontinck, aka ‘Sayfullah Ahlu Sunna’, the young convert from Antwerp who was recently released from jail. Bontinck joined the ranks of ISIS, but returned to Belgium after the much publicized search his father undertook in Syria. At first, he denied he had been fighting, but later he apparently cooperated with security services, testified against his former comrades and told he doesn’t support ISIS anymore — which resulted in death threats against him already. One of the conditions for his release was refraining from contacts with his former extremist companions, and after the Belgian newspaper ‘Het Laatste Nieuws’ today reported his adherence to the Facebook group, his ‘like’ has quickly disappeared. The widow of the Belgian Syria fighter Tarik Taketloune has put two movies on the internet that show her while she is learning to shoot — videos that we exclusively obtained. The young woman followed her husband to Syria in May, witnessed how he was killed in June, and now apparently prepares to fight herself. Nora Verhoeven (19) was born in Brussels as the daughter of a Belgian father and a mother of Moroccan descent. Her family did not much adhere to religion, but for her that changed during her now 2,5 years old relationship with Taketloune. Taketloune (20) was a follower of the radical ‘Shariah4Belgium’ organization and travelled to Syria in September 2012 in order to fight. It is unclear which militia he joined, but it’s known that most of the Belgian Syria fighters chose for radical jihadist groups. In April 2013 a first attempt of ‘Oum Khattab’ — as Verhoeven is calling herself — to follow in his footsteps failed. But in May she succeeded. Barely three weeks after their reunification though, Taketloune was killed by an unknown group of armed men that raided their Aleppo hideout. Verhoeven herself was injured, but she survived the attack. She told her mother about it in a phone call and said she wanted to stay in Syria “to do the good thing”. After several months of silence, she restarted to post messages and pictures on her Facebook account in November 2013. One of her most recent messages was an advice to her friends: “Avoid the evil, because one day it all will be over.” And as told above, she also showed herself practising with fire arms — a hand gun and an Austrian made Steyr AUG assault rifle. Salafist preachers from the Balkans were invited to events in Belgium on several occasions this year. Among them two people who are suspected of links with terrorism in their own countries. One of the preachers reportedly also recruits for Jihad in Iraq and Syria. The organization that invited them, is a Belgian group of islamic Romani — gypsies, as most people call them. On June 22, an islamic seminary with foreign guest speakers was held in the Belgian town of Heusden-Zolder. Two of those guests came from the Balkans: the Bosnian Bilal Bosnic and the ethnic Albanian from Macedonia Bekir Halimi — as the Belgian anti-jihadi group ‘Vlaams Comité voor Ex-moslims’ signalled to the daily newspaper ‘Het Laatste Nieuws’. Halimi runs a charity — Bamiresija — which raised serious suspicions in 2008, as it appeared to get large sums of money from the Kuwaiti ‘Revival Islamic Heritage Society’, blacklisted by the United Nations because of their close ties to terrorist organizations, including Al Qaeda. And according to US intelligence services, Halimi already launched some appeals to attack Jewish synagogues. Bosnic — seen on the event in Heusden-Zolder here — is known as secondant of Nusret Imamovic, the most notorious of all salafists in Bosnia. They operate from the village of Gornja Maoca, where only radical muslims are allowed to enter. In February of last year, police raided the village and arrested Imamovic and Bosnic on suspicion of complicity in the October 2011 terrorist attack against the US embassy in Sarajevo. That attack was carried out by a resident of Gornja Maoca. But lack of proof about their role made that Imamovic and Bosnic soon were free again. Though it is sure that Bosnic already explicitly has called for terrorist attacks. “With explosives on our chests we pave the way to paradise”, he sings in a video that circulates on the net. Reportedly, the village of Gornja Maoca also is serving many years already as a transit point for foreign fighters on their way to Jihad in countries such as Yemen and Iraq. Bosnic is named as the main responsible for their transport and recent reports point to the village as a transit point for Syria too. 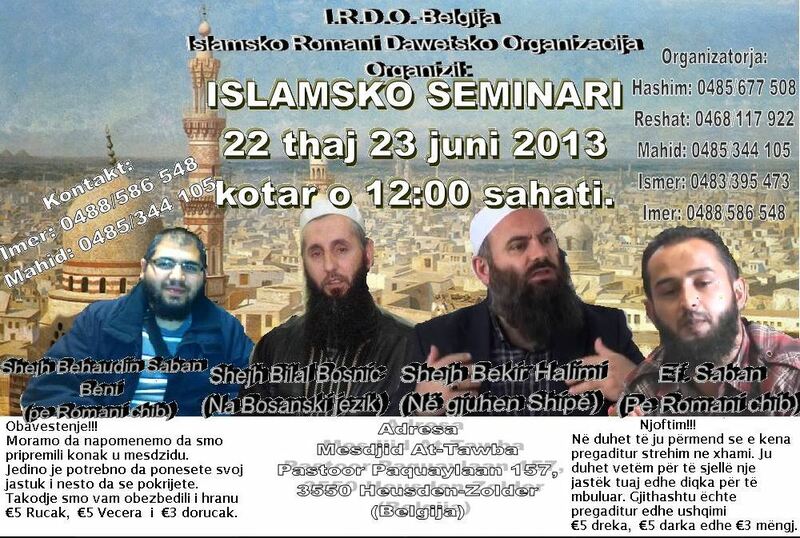 The group that invited Bosnic and Halimi to Belgium — and did it at least two times in 2013 with the latter — is the ‘Islamsko Romani Dawetsko Organizacija’ of ‘IR-DO’ — translated as the organization for preaching of islamic Romani. ‘IR-DO’ has branches in the whole of Western Europe and in Belgium it is active for example in the towns of Sint-Niklaas and Tienen. It’s focussed on Romani people from Bosnia-Herzegovina, Albania, Macedonia and Kosovo. In the course of time, Romani people usually adhered to the religion of the country in which they settled, meaning that a lot of them are christians. But in Balkan countries, there are also many muslims amongst them. 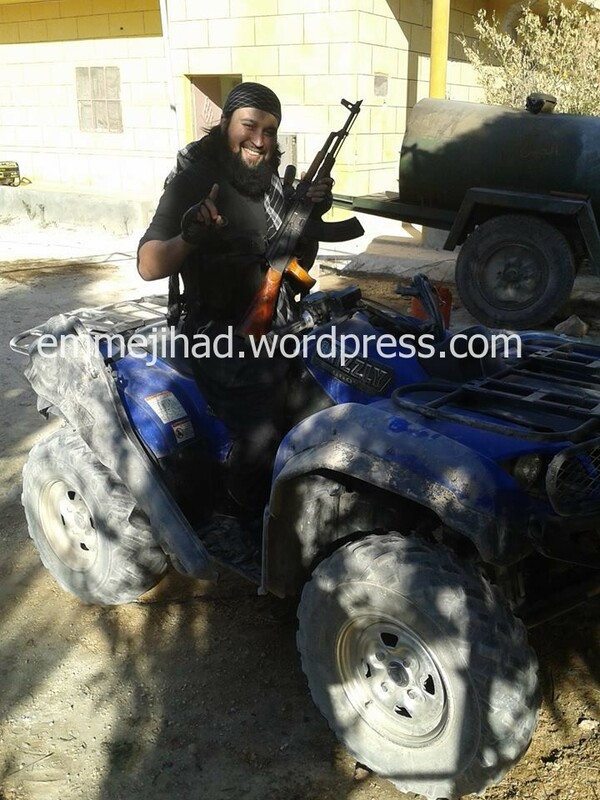 It isn’t clear whether the visits of Bosnic and Halimi already resulted in Belgian Romani joining the Jihad in Syria. Certain though is that their communities do raise money for ‘Helfen in Not’, a rather suspicious German organization. ‘Helfen in Not’ poses as a humanitarian organization that brings relief to Syria. But German security services explicitly warned last September that it’s mainly a salafist propaganda tool. In Germany, it is even suspected of compliticy in the abduction of three genuine aid workers in Syria in May 2013. The victims — two of which were relased in July and the third in September — were building a clinic in the northern Syrian town of Haram. Apparently, ‘Helfen in Not’ was a building a coranic school in the same town and a member of the organization was seen there in a military uniform.